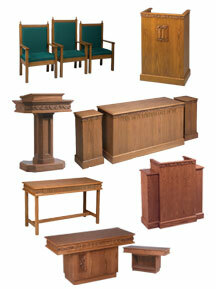 Shop pulpit sets to find everything you need for your church’s sanctuary. Crafted with durable wood, these pieces are designed to last. Our 400 series offers a classic design for your sanctuary. This complete set provides all the basic sanctuary furniture in one package. This elegant pulpit grouping is designed with an elegant grape and leaf mold that ties the furniture together. 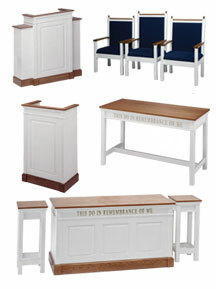 This pulpit furniture set features a colonial style two-tone for added contrast. Complete your sanctuary with these essential items! This entire set is custom hand-crafted using cove molds and applied moldings which create the beautiful window effect on the pulpit and communion table. 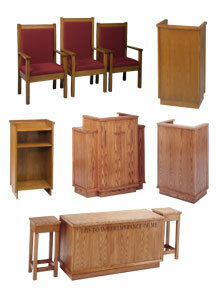 Pulpit sets provide a convenient way for you to purchase your sanctuary furniture. Our groupings are arranged with matching pieces, complete with pulpits, lecterns, flower stands, communion tables, and pulpit chairs. 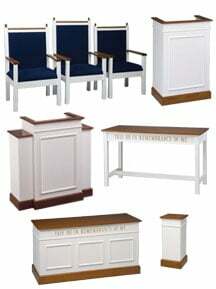 Save your church the inconvenience of ordering multiple pieces over time; receive them all bundled together in a set.